Does valuation matter when negotiating a merger deal? Does a company’s debt make it more or less attractive in a takeover situation? How can two companies merge completely different cultures to make one, improved entity? High-level corporate expertise can be the arrow missing in a young lawyer’s quiver. So, Tulane Law School and the A.B. Freeman School of Business teamed up three years ago to hold a Business Literacy Boot camp for first-year law students. Running concurrently with the January legal skills Intersession Boot Camp for upperclassmen, which took place last week, the program packs an introduction to what is often a daunting business world. See the boot camp's photo gallery here. Along with Prof. Mara Baumgarten Force and a handful of law and business school faculty, the business literacy boot camps cover the basics of business, capped off by a Friday presentation by students to a “mock” board of directors considering the merger of two airlines. 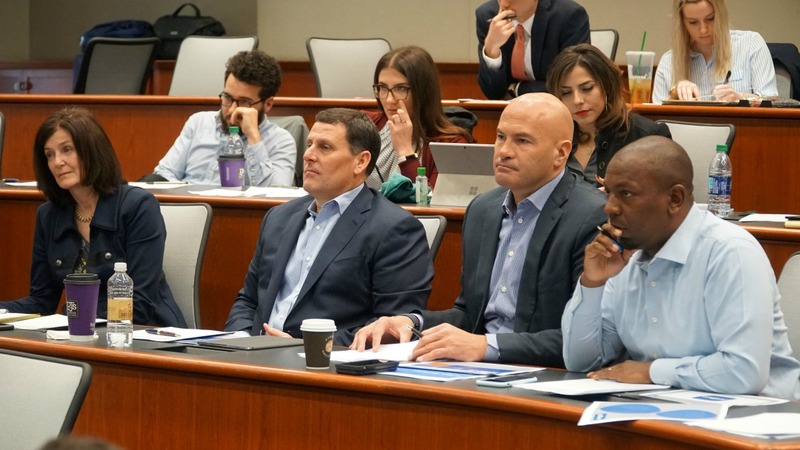 Throughout the week, visiting faculty step in to lecture and mentor students as they prepare for that final test, considering everything from company values to new market opportunities to the blending of corporate cultures. This year, the program registered about a quarter of the first-year class, and has consistently upped the ante on landing top-notch speakers and industry leaders who lecture students, coach and critique, and serve as “board members” during the Friday morning presentations proposing a mock merger between two airlines. Jim Hnat, former General Counsel, Executive Vice President and Corporate Secretary of JetBlue. Laurel Sheridan was a first-year law student in 2018 when she signed up. This year’s students said the crash-course on business practices gave them confidence. Aside from the practical skills, the first-year participants got something more. “The best part of the week was working with people I didn’t have classes with and learning something new together,” Jacob Soto (L’21), said just after his group faced the board with their proposal. Law school classes typically focus on how lawyers can advance their clients’ interests. And other skills-building offerings, such as the Intersession boot camp for second- and third-year students, cover the mechanics of drafting business documents and closing deals. Trial advocacy teaches litigation tools. But a course that puts law students in the role of business consultant helps them see pressures and opportunities from the client’s perspective, said Calderon.